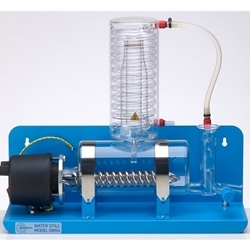 Glass distiller output capacity 4Litres/Hour pyrogen free* single distilled water. Distillate quality complies with European Pharmacopoeia for Purified Water & A.S.T.M. Type 4. Pyrex® glass boiler and condenser minimise potential contamination of distillate from the leaching effect of distilled water on metal components. Distillate pH5.0-6.5. Distillate conductivity 3.0-5.0uS/cm. 3kW chromium plated heating element with 2 independent re-settable thermostats protect the still in the event of water supply failure. Easy to clean. No glassware dismantling is required. Can be wall or bench mounted. CE marked by independent testing agency. Supplied with instruction/operating manual. Quickfit and Quartz launched their first ever Water Stills more than 60 years ago. Now SciLabware is proud to re-introduce the Quickfit® name into the glass distiller market with the new Quickfit® QWS4 Water Still. Manufactured in the UK, the QWS4 combines high performance with value for money. Other Water Stills may look similar, but only the QWS4 features a high-quality Pyrex® glass boiler and condenser. The chromium plated heating element is fitted with two thermostats to protect the still from overheating in the event of water supply failure. The thermostats can be reset to resume Water Still operation when the water supply has been restored. The highly efficient Pyrex® glass coil condenser, fitted with detachable plastic screw thread connectors, ensures that the distillate is cooled ready for use. No dismantling required. The Pyrex® glass boiler is fitted with a built-in funnel to allow the quick and easy addition of cleaning solutions. Once the cleaning solution has done its job, simply open the GP Rotaflo® PTFE stopcock to drain the solution out of the boiler. The QWS4 will produce 4litres/hour of pyrogenfree* distilled water from its reliable 3kW UK manufactured, chromium plated heating element. Electrical: 110-120 Volt - Note: Power cord does not have a plug attached as it is intended to be connected directly to the electrical supply. However an appropriate plug may be obtained by user and attached to the power cord if desired. * Care must always be taken to obtain pyrogen-free distilled water. The distillate must be tested prior to use. Quickfit®, Pyrex® and Rotaflo® are registered trademarks.